RIEDENSCHILD: WavemasterPro -- Diver watch, Automatic. o GeMatic Kaliber 0888 Basis Kaliber ETA 2824-2 with 24 rubins. o 28800 semi-oscillations per hour, 42 hours power reserve. o Massive stainless steel case (316L) polished. 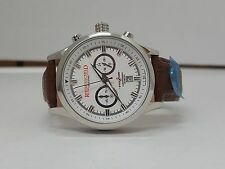 1 Watch new. you get in this Sale as see in picture. 1 certificate. LIPORIS is an online watch dealer from southern Germany. Marke Riedenschild. Armbandtyp Milanaise-Armband. Ansatzbreite 22mm. Armbandmaterial Edelstahl. Uhrengehäuse-Finish Glanz. EAN Nicht zutreffend. 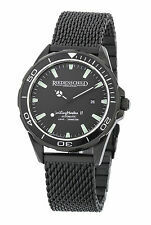 RIEDENSCHILD DIVER WATCH. big Riedenschild box. black dial. genuine picture. hight is 14 mm. Riedenschild Sailingmaster II. LIPORIS is an online - Watch dealer from South Germany. We have a large selection in the visually impaired and blind watches. Marke Riedenschild. Function: date display, fluorescent hands and hour markers.